These are the best places in Puerto Rico for a variety of activities, special moments, and unique attractions. This includes things you may not even know about, like the best place to spot a whale, the best place to pop the question, the best place to glow in the dark, and more. There is only one manmade structure on the island, and that too an unoccupied one: the tiny Culebrtita lighthouse. It is very possible that you will share this beach with just a handful of visitors. Playa Tortuga is a beautiful crescent of sand where the water is protected from the fury of the tides by encircling arms of the island. With the exception of a network of trails and precious few structures, the El Yunque National Rainforest has remained untouched for millennia. If you want to immerse yourself in the natural beauty of the island's interior, this is where you want to be. Lush vegetation, birdsong, the musical chirp of the coqui frog... these were the first inhabitants of Puerto Rico, and they remain to this day. There are few places as romantic in Puerto Rico as Old San Juan, and in Old San Juan, few places as lovely as the Raíces Fountain at the end of Paseo La Princesa. If you want a special moment with your loved one, take them on a stroll down the pedestrian-only Paseo right before sunset. Along the way are sidewalk vendors and maybe even live music, with the ancient city walls rising above on your right. In the distance, you'll see the beautiful fountain, its lights coming on as the sun sets, and behind it the calm bay of San Juan. Try to get here in time to watch the sunset, which dazzles on the water. Even at night, this is a special place to collect that kiss or ask that ever-important question: What do you feel like eating? While El Yunque is a special place, it doesn't present the wonder of the Camuy Caves, an incredible network of subterranean caves. There are several tour companies that offer tours to Camuy, which range from sightseeing to spelunking. But however you choose to see them, the caves are worth the trip if you want to be amazed by nature. There's really nothing quite like it. A swim in one of Puerto Rico's biobays ​is a thrilling experience where you literally glow in the dark, thanks to organisms in the water that react to you, as well as just about everything else. They're harmless to you (and you to them), and they make swimming at night a wondrous, shimmering fantasy. The best biobay (or bioluminescent bay, if you want to get technical) is in Vieques, but there are others at La Parguera, in the south of the island, and at Fajardo, in the east. Of these two, Fajardo is the better choice. A reliable guide to this bay is Yokahú Kayak Trips. It's not a widely known fact, but from Puerto Rico's western coast, you can spot migrating humpback whales in the winter from Rincón. The best time to go is in February, but they've been seen from December to March. You can see them from land at the Rincón Lighthouse. When you've been around for more than four hundred years, you tend to collect a few ghosts, and Old San Juan has its share. 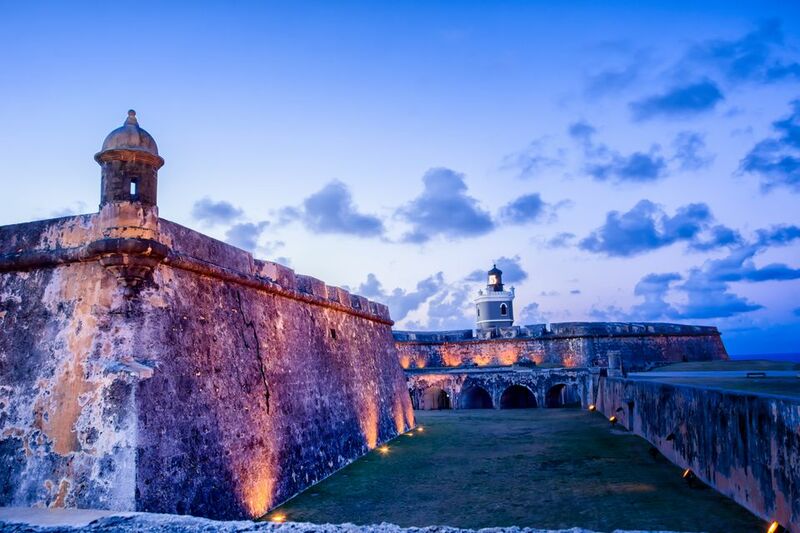 Just ask your guide when you take the San Juan Nights tour. But if you want to do a little solo spook-searching, head to El Morro at night, where, legend says, the ghost of a white lady can often be seen. This is a tough category because there are obviously tons of places where the locals go to have fun, and there are tons of fun hangouts around the island. We narrowed it down to where locals go to eat, meet friends, spend a few hours, sing, dance and hit the beach (and generally do the things we fly thousands of miles to do) and came up with two candidates: The combination of the Kiosks on Route 3 and Piñones. The first can be reached, naturally, by driving from San Juan along Route 3 until you come to a long line of roadside eateries, usually packed with people. Eating here is an experience. Piñones offers a similar hangout, but right by the beach. There's no better way to see the full pageantry of Puerto Rican culture than at the Ponce Carnival. The carnival takes place in February, right before Ash Wednesday, just like the Carnival in Rio and Mardi Gras. But this is a purely Puerto Rican tradition that has been celebrated for more than a century and stars a folkloric costumed demon called The Vejigante. If you want to see the island at its brightest, most vibrant, and most festive, come and join the hordes of revelers for this special event.